Almendral Doncel R. Myths and facts about the Mozart effect. Rev Pediatr Aten Primaria. 2018;20:e83-e88. Solé Delgado C, Fabra Garrido C, Bonet de Luna C. The greek Kairos: how and when disclose to our patient or parents what we suspect. Rev Pediatr Aten Primaria. 2018;20:261-7. Parera Pinilla CL, Ochoa Fernández BM, Bonet de Luna C. Celiac disease: who knows where. Rev Pediatr Aten Primaria. 2018;20:269-76. Alfaro Alfaro A, Castejón Navas I, Magán Sánchez R, Alfaro Alfaro MJ. Molar-incisor hypomineralization syndrome. Rev Pediatr Aten Primaria. 2018;20:183-8. Morata Alba J, Morata Alba L. Vomiting and abdominal pain: sometimes we may be surprised. Rev Pediatr Aten Primaria. 2017;19:367-71. Távara Vidalón P, Lafuente Sotillos G, Palomo Toucedo I, Manfredi Márquez MJ. Review of the effectiveness of molded insoles in pediatric flatfoot. Rev Pediatr Aten Primaria. 2017;19:e123-e131. Ares Álvarez J, Martínez de la Ossa Sáenz-López R, Alfayate Miguélez S, Grupo de Patología Infecciosa de la AEPap. Quinolones in Pediatrics. Rev Pediatr Aten Primaria. 2017;19:e83-e92. Arroyo Fernández A, Bertomeu Ruiz A. Uncommon intoxications: review and legal framework. Rev Pediatr Aten Primaria. 2017;19:e27-e39. Hypercalciuria, hypocitratura and ketogenic diet: stumbling over the same stone? Martín Rivada A, Bonet de Luna C. Hypercalciuria, hypocitratura and ketogenic diet: stumbling over the same stone? Rev Pediatr Aten Primaria. 2016;18:e223-e228. Suárez Rodríguez MA, Muñoz Lozón A. Neuropsychiatric disorder: uncommon but possible. Rev Pediatr Aten Primaria. 2016;18:369-73. Giménez Badia S, Albares Tendero J, Canet Sanz T, Jurado Luque MJ, Madrid Pérez JA, Merino Andreu M, et al. Delayed sleep wake phase disorder (DSWPD). Rev Pediatr Aten Primaria. 2016;18:e129-e139. Crehuet Gramatyka D, Navarro Rubio G. Therapeutic management of biliary atresia. Rev Pediatr Aten Primaria. 2016;18:e141-e147. La Orden Izquierdo E, Segoviano Lorenzo MC, Verges Pernía C. Complementary feeding: what, when and how. Rev Pediatr Aten Primaria. 2016;69:e31-e35. Induced off-label drug prescribing. Shared responsability? Martínez González C, Bravo Acuña J. Induced off-label drug prescribing. Shared responsability? Rev Pediatr Aten Primaria. 2016;69:59-63. Bello Gutiérrez P, Mohamed Dafa L. Glucose-6-phosphate dehydrogenase deficiency: review apropos of a clinical case. Rev Pediatr Aten Primaria. 2015;17:361-8. Comín Cabrera C, Sánchez Perales F. Stridor causes. Laryngomalacia: two infrequent cases. Rev Pediatr Aten Primaria. 2015;17:e271-e278. Piñeiro Pérez R, Carabaño Aguado I. Animal bites in Spain. Pediatric guideline for Primary Care. Rev Pediatr Aten Primaria. 2015;17:263-70. Piñeiro Pérez R, Carabaño Aguado I. Insect bites in Spain. Pediatric guideline for Primary Care. Rev Pediatr Aten Primaria. 2015;17:159-66. Basulto J, Manera M, Baladia E. Dietary intake of nitrate in Spanish infants and children and risk of methemoglobinemia. Rev Pediatr Aten Primaria. 2014;16:65-9. Baladia E, Basulto J, Manera M. Nutrition and health claims on products for infant feeding in Spain and the European Union. Rev Pediatr Aten Primaria. 2013;15:351-9. Fernández López T, Ares Mateos G, Carabaño Aguado I, Sopeña Corvinos J. Late preterm infant: the forgotten patient. Rev Pediatr Aten Primaria. 2012;14:e23-e8. Landa Rivera L, Díaz-Gómez M, Gómez Papi A, Paricio Talayero JM, Pallás Alonso CR, Hernández Aguilar MT, et al. Bed-sharing favours the practice of breastfeeding and does not increase the risk of sudden infant death syndrome. Sleeping with parents. Rev Pediatr Aten Primaria. 2012;14:53-60. García Blanco L, Azcona San Julián C. Hyperandrogenism: precocious pubarche and polycystic ovary syndrome. Etiology and therapeutic possibilities. Rev Pediatr Aten Primaria. 2012;14:61-7. Carabaño Aguado I, La Orden Izquierdo E, Santonja Garriga C, Pelayo García FJ, Llorente Otones L, Manzarbeitia Arambarri F. Pathogenesis and endoscopic findings in H. pylori infection in children. Rev Pediatr Aten Primaria. 2012;14:69-74. Ortiz Movilla R, Acevedo Martín B. Child vulvovaginitis. Rev Pediatr Aten Primaria. 2011;13:601-9. Pelayo Baeza FJ, Carabaño Aguado I, Sanz Santaeufemia FJ, La Orden Izquierdo E. Ambiguous genitalia. Rev Pediatr Aten Primaria. 2011;13:419-33. Nutrition assessment in Primary Care, is it possible? Herrero Álvarez M, Moráis López AB, Pérez Macarrilla JD. Nutrition assessment in Primary Care, is it possible? Rev Pediatr Aten Primaria. 2011;13:255-69. La Orden Izquierdo E, Carabaño Aguado I, Pelayo García FJ. Current status of lactose intolerance in children. Rev Pediatr Aten Primaria. 2011;13:271-8. Ortiz Movilla R, Acevedo Martín B. Assisted reproductive techniques and child health. Rev Pediatr Aten Primaria. 2010;12:651-71. Fernández Cuesta LM. Thimerosal in pediatric practice. Rev Pediatr Aten Primaria. 2010;12:673-83. Pneumococcal conjugate vaccine. Is it a suitable universal prevention of the pneumococcal disease? Gorrotxategi Gorrotxategi P, Iturrioz Mata A. Pneumococcal conjugate vaccine. Is it a suitable universal prevention of the pneumococcal disease? Rev Pediatr Aten Primaria. 2010;12:443-55.
del Rosal Rabes T, Baquero Artigao F, García Miguel MJ. Cutaneous leishmaniasis. Rev Pediatr Aten Primaria. 2010;12:263-271. Pereda Beltrán N. Physical consequences of child sexual abuse: an update. Rev Pediatr Aten Primaria. 2010;12:273-285. Crespo Marcos D, Pérez-Lescure Picarzo J, Zambrano Castaño M. Chest pain. Rev Pediatr Aten Primaria. 2010;12:95-107. Barrio Merino A, Soria López M, Tomé Nestal C. Treatment of functional constipation with Polyethylenglycol. New drugs. Rev Pediatr Aten Primaria. 2010;12:109-21. Herranz Jordán B. Control of children with congenital heart diseases in Primary Care. Rev Pediatr Aten Primaria. 2009;11:639-55. Incontinence and urination disorders: what can we do? San José González MÁ, Méndez Fernández P. Incontinence and urination disorders: what can we do? Rev Pediatr Aten Primaria. 2009;11:e1-e29. Villanueva Suárez C, Sanz Rodríguez LJ. Separation anxiety: concept delimitation, clinical manifestations and intervention strategies. Rev Pediatr Aten Primaria. 2009;11:457-69. Ortiz Sanjuán FM, Pastor Bataller S, Mas Lázaro C, Tomás Aguirre B, Calabuig Fresquet A, Salort Jiménez I. Paroxistical supraventricular tachycardia in infants. A case report. Rev Pediatr Aten Primaria. 2009;11:89-95. The heptavalent pneumococcal conjugate vaccine: lights and shades? San José González MÁ, Méndez Fernández P. The heptavalent pneumococcal conjugate vaccine: lights and shades? Rev Pediatr Aten Primaria. 2008;10:467-88. Herranz Jordán B, Abad Irazusta E. Head lice. Rev Pediatr Aten Primaria. 2008;10:267-86. Sanz Santaeufemia FJ, Roa Francia MA, García Talavera ME, Tejedor Torres M, Sebastián Planas M. Rotavirus: old illness, new vaccines. Rev Pediatr Aten Primaria. 2008;10:89-98. Cervera Bravo A, Cela de Julián E. Sickle cell disease. Primary Care management. Rev Pediatr Aten Primaria. 2007;9:649-68. 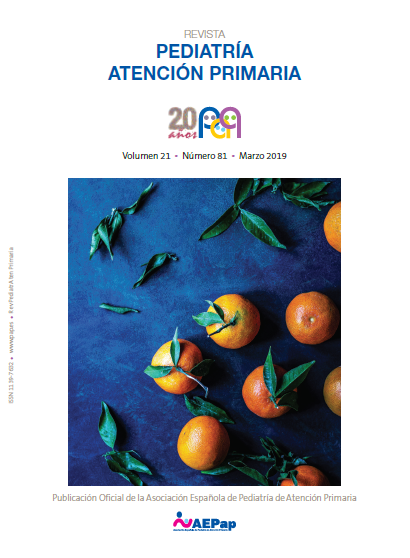 Carabaño Aguado I, Llorente Otones L. Haemophilia: perspective and advice in Primary Care. Rev Pediatr Aten Primaria. 2007;9:465-74. Ortiz Movilla R, Álvarez Fernández B, Martínez Bernat L, Iglesias González-Nicolás E, Muro Brussi M. Epidemiology and prevention of respiratory syncytial virus. Rev Pediatr Aten Primaria. 2006;8:627-40. Gómez Carrasco JÁ. Asthma during the first years of life and its relation to viral infections. Rev Pediatr Aten Primaria. 2006;8:453-75. Ramón Rosa MF, Ballesteros Jerónimo S, Martínez Arrieta R. Neuroleptic intoxications. Rev Pediatr Aten Primaria. 2006;8:439-52. Oliván Gonzalvo G. Adoption in the Russian Federation and Eastern Europe: health problems and medical recommendations. Rev Pediatr Aten Primaria. 2006;8:265-81. Meningococcal C disease in Spain. Is it necessary to change the vaccination schedule? Fernández Cuesta LM. Meningococcal C disease in Spain. Is it necessary to change the vaccination schedule? Rev Pediatr Aten Primaria. 2006;8:87-100. Navarro Alonso JA. Immunization against serogroup C Neisseria meningitidis with conjugated vaccines: seven years’experience. Rev Pediatr Aten Primaria. 2006;8:65-86. Cervera Bravo A. Cancer. General environment. Basic aspects of epydemiology, aetiology, genetics and diagnosis. Rev Pediatr Aten Primaria. 2005;7:423-439. Recuero Gonzalo R, Bonet de Luna C. Jealousy in children. Rev Pediatr Aten Primaria. 2005;7:413-421. Bras i Marquillas J. Childhood and adolescence obesity. Rev Pediatr Aten Primaria. 2005;7:209-230. What do we mean when we talk abour peer bullying in schools? del Barrio C, Gutiérrez H, Barrios Á, van der Meulen K, Granizo L. What do we mean when we talk abour peer bullying in schools? Rev Pediatr Aten Primaria. 2005;7:75-100. Díaz Pernas P, Bonet de Luna C. Temper tantrums. What are they and how to help parents to overcome them. Rev Pediatr Aten Primaria. 2005;7:67-74. García Sánchez N, de Juan Martín F. Concerns about immigrant child immunization. Rev Pediatr Aten Primaria. 2005;7:53-66. Casaní Martínez C. Childhood accidents: everybody´s task. Rev Pediatr Aten Primaria. 2004;6:583-595. Rico Marí E, Borja Pastor MC, Codoñer Franch P, Úbeda Sansano MI. Chronic abdominal pain in childhood. Going to a high resolution healthcare in Primary Care. Rev Pediatr Aten Primaria. 2004;6:597-604. Patiño Masó J, Puig Congost M. Nursing care to childhood and adolescence. The need of a specific and independent specialty. Rev Pediatr Aten Primaria. 2004;6:605-615. Vargas Pérez ML, Morell Bernabé JJ, González Roiz C, Melero Ruiz J. Advances in pathogenesis and immunologic diagnosis of celiac disease. Diagnistic protocols in Primary Care. Rev Pediatr Aten Primaria. 2004;6:443-462. Muñoz Hiraldo ME, Acosta Navas B. Pediatric emergencies equipment in Primary Care. Rev Pediatr Aten Primaria. 2004;6:221-231. Casaní Martínez C. Vaccination and pregnancy. Rev Pediatr Aten Primaria. 2004;6:51-62. García Izquierdo F, Nuño Mateo F, Gorritxo Gil B. Primary Care pediatrician´s attitude on dentoalveolar traumas. Rev Pediatr Aten Primaria. 2003;5:589-601. Chronic functional constipation in adolescence. Is it a problem of education for health? Magaña Hernández M. Chronic functional constipation in adolescence. Is it a problem of education for health? Rev Pediatr Aten Primaria. 2003;5:423-432. Aguilar de Armas I. Acute Otitis Media in children. Bibliographic review. Rev Pediatr Aten Primaria. 2002;4:593-618. Bamonde Rodríguez L, Caamaño Santos B, Alonso Martín MR. Procalcitonin as a marker of infection. A review from Primary Care. Rev Pediatr Aten Primaria. 2002;4:619-630. Díaz de Bustamante A. Update of Genetics in Pediatrics. Rev Pediatr Aten Primaria. 2002;4:261-279. Silber T, Castells P. Sexual identity expressions and the sexuality of the adolescent. Rev Pediatr Aten Primaria. 2002;4:245-259. Fernández-Cuesta Valcárcel MÁ, Pascual Pérez JM, de Hoyos López MC. Management update of pharyngotonsilitis, otitis and sinusitis in Pediatrics. Rev Pediatr Aten Primaria. 2002;4:229-243. Colaboración Cochrane. Acellular vaccines for prevention of whooping cough in children. Rev Pediatr Aten Primaria. 2001;3:617-625. Brañas Fernández P. Gynaecologic problems in adolescence. Guide for the pediatrician. Rev Pediatr Aten Primaria. 2001;3:597-615. Castellano Barca G, Hidalgo Vicario MI. Let´s learn to interview adolescents. Adolescent physical examination. Rev Pediatr Aten Primaria. 2001;3:583-596. Puertas Bordallo D, Acebes García MM. Ophthalmologic emergencies in Primary Care Pediatrics. Rev Pediatr Aten Primaria. 2001;3:411-424. Garat JM. Prepuce conservative management. Rev Pediatr Aten Primaria. 2001;3:425-433. Colaboración Cochrane. Comparision between antileukotrien agents and inhaled corticoids in management of recurrent and/or chronic asthma. Rev Pediatr Aten Primaria. 2001;3:435-444. Colaboración Cochrane. Visual screening exams for detection of amblyopia in pre-school children: systematic review. Rev Pediatr Aten Primaria. 2001;3:249-250. Mardomingo Sanz MJ. Clinical features of anxiety conditions. Rev Pediatr Aten Primaria. 2001;3:237-247. Avilla Hernández JM, Muñoz Bermudo F. Asymptomatic bacteriuria in children. Rev Pediatr Aten Primaria. 2001;3:227-235. Colaboración Cochrane. Infant colic treatment: Collaboration Cochrane systematic review. Rev Pediatr Aten Primaria. 2001;3:85-89.
del Castillo Codes M, Delgado Martínez AD. Pain syndromes of the foot children. Rev Pediatr Aten Primaria. 2001;3:67-84. Martínez González C, Figueroa M-Buitrado M. Child sexual abuse. Rev Pediatr Aten Primaria. 2000;2:589-597. Colaboración Cochrane. Improving the Quality of Reporting of Randomized Controlled Trials. The Consort Statement. Rev Pediatr Aten Primaria. 2000;2:599-608. Ausejo Segura M, Sáenz Calvo A. Glucocorticoid treatment in patients with croup: application of scientific evidence into practice. Rev Pediatr Aten Primaria. 2000;2:441-444. Colaboración Cochrane. Effectiveness of glucocorticoids in the treatment of patients with crup: meta-analysis. Rev Pediatr Aten Primaria. 2000;2:435-439. Ortiz Movilla R, Prados Martín J, Ramírez Parenteau S, Sáez Pérez E. Management in practice of acute gastroenteritis in pediatric patients. Rev Pediatr Aten Primaria. 2000;2:417-433. Suárez L, Kirchschläger E, Perdomo M. Acute diarrhea handling. What are we doing? What are the current scientific evidences? Proposal of a consensus. Rev Pediatr Aten Primaria. 2000;2:253-261. Sánchez C, Escribano Ceruelo E, Avilla Hernández JM, Borbujo J, Ocaña AI. Dermatomyositis. Rev Pediatr Aten Primaria. 2000;2:263-273. Colaboración Cochrane. Allergenic Inmunotherapy for Asthma. Rev Pediatr Aten Primaria. 2000;2:275-276. Colaboración Cochrane. Holding chambers versus nebulisers for ß-agonist treatment of acute asthma. Rev Pediatr Aten Primaria. 2000;2:95-99. Barrio Gómez de Agüero MI, Alonso Martínez I. Inhaling devices in children. Rev Pediatr Aten Primaria. 2000;2:83-94. Valverde Gómez F, Camps Rubiol T, Roldán Martín MB. Coeliac disease. Rev Pediatr Aten Primaria. 2000;2:63-82. Ramos Fuentes FJ, González Iglesias E. Fragile X Syndrome. Rev Pediatr Aten Primaria. 1999;1:575-590. Ramos Fernández JM, Hernández Lorca MA, Vázquez Castro J, Aparicio Meix JM. Attention-deficit-hyperactivity disorder: update. Rev Pediatr Aten Primaria. 1999;1:591-605. Navarro AB, González A, Javier Gil F, Rioboo R. Baby bottle caries. Rev Pediatr Aten Primaria. 1999;1:607-622. Colaboración Cochrane. Growth evaluation in children. Rev Pediatr Aten Primaria. 1999;1:623-628. Colaboración Cochrane. Antibiotics in salmonella bowel infections. Rev Pediatr Aten Primaria. 1999;1:453-456. López-Hermosa Seseña P. Current role of Mantoux in children. Rev Pediatr Aten Primaria. 1999;1:439-451. Varicella: is it useful its prevention? Roldán Martín MB, Rodríguez Morales D, San José Hernando MD. Varicella: is it useful its prevention? Rev Pediatr Aten Primaria. 1999;1:417-437. Colaboración Cochrane. Antibiotic versus placebo for acute otitis media in children. Rev Pediatr Aten Primaria. 1999;1:285-288. González Sanz A, Gil González J, Gil González C, Algar Pinilla J, Alos Cortés L, Rosado Olaran J. Basis for the rational use of fluoride in paediatric caries´ prevention and treatment. Rev Pediatr Aten Primaria. 1999;1:265-283. Benito Alonso E, Piñero López E. Do healthy babies need vitamins suplements? A literature review. Rev Pediatr Aten Primaria. 1999;1:101-108. Martí Fernández J, Bonfill X, Mejía R, Tohá D. Going to a paediatric care based on scientific evidence. Cochrane collaboration. Rev Pediatr Aten Primaria. 1999;1:87-100.